September 19 — St. Januarius, Bishop and Martyr - Optional Memorial - My Catholic Life! In every lost corner and hidden valley of the Catholic world is a painting of the Virgin Mary that cries watery tears, a crucifix whose hair grows and must be cut with scissors, a white host from which issues drops of red blood, or a sacred pool whose baths make the blind see and the lame walk. Of all the miracles, wonders, and theological rarities that leave God’s family in awe, the miracle of today’s saint is one of the most astounding. Three times a year, on his day of martyrdom, September 19th; on the day of his commemoration as patron of Naples, December 16; and on the Saturday before the first Sunday of May, recalling the gathering together of his various relics, the blood of Saint Januarius liquefies. Since at least the 1300s, a small glass vial holding a deep-red, stable substance has been removed from a safe location and brought before the faithful in the Cathedral of Naples by a priest or bishop. The vial is placed near the other relics of Saint Januarius which rest under the altar. And then the drumbeat of prayers start. They sometimes continue for hours and sometimes for minutes. God is bidden, fuel is poured on the fire of faith, and the mysterious moment arrives. Spontaneously, the stable, solid, red substance is transformed into a liquid that splashes around the inside walls of the vial for all to see. The blood of Saint Januarius has come to life. The city of Naples fires a twenty-one-gun salute from a nearby castle to signal that the transformation has occurred. There is no explanation for how this happens. But it happens, happens often, and has happened consistently for many centuries. The proof is the outcome itself. That a solid substance liquifies cannot be debated. The liquified blood must be the starting point for speculation, not a presumption of magic or sleight of hand. That some things of God cannot be explained without the informed trust of faith is simply to state that believers did not make God up. He is not understandable. If He were, then He would fit conveniently into our tiny brains and thus not be God. But no faith is needed to accept this miracle. What happens is a fact. Little is known about the life of Saint Januarius. An extant letter from 432 mentions him as if he were already well-known. 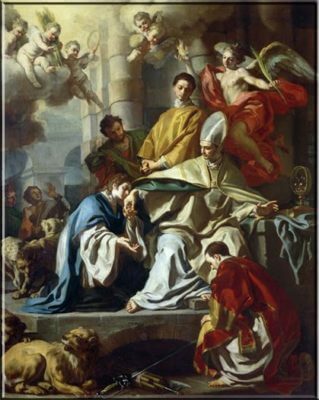 It states that a nearby bishop, a friend of Saint Augustine named Saint Paulinus of Nola, had a vision of Januarius just before Paulinus died, and that Januarius was a bishop and martyr and a well-known member of the Church of Naples. It is believed that our saint was beheaded during a persecution under the reign of Diocletian, in the decade before Christianity was legalized in the early 300s. Perhaps the most interesting thing about the liquifying of Saint Januarius’ blood is that it occurs for no specific purpose. No sick person is healed, no sacrament is celebrated, no bishop is elected. It is a divine folly. It occurs to edify, to entertain, and to inspire, as if religion were a theological sport, with God simply putting His talents on display for all to behold the spectacle from the pews, to gaze, mouth agape, at a wonder that can neither be explained nor be resisted. Saint Januarius, you died for the faith of the Church just as the Christian era dawned. May we follow your example of generous witness and stand astonished at the mysterious miracle that puts your name on so many lips so many centuries after you perished for Christ. MANY centuries ago, St. Januarius died for the Faith in the persecution of Diocletian, and to this day God confirms the faith of His Church, and works a continual miracle, through the blood which Januarius shed for Him. The Saint was Bishop of Beneventum, and on one occasion he travelled to Misenum in order to visit a deacon named Sosius. During this visit Januarius saw the head of Sosius, who was singing the gospel in the church, girt with flames, and took this for a sign that ere long Sosius would wear the crown of martyrdom. So it proved. Shortly after Sosius was arrested, and thrown into prison. There St. Januarius visited and encouraged him, till the bishop also was arrested in turn. Soon the number of the confessors was swollen by some of the neighboring clergy. They were exposed to the wild beasts in the amphitheatre. The beasts, however, did them no harm; and at last the Governor of Campania ordered the Saints to be beheaded. Little did the heathen governor think that he was the instrument in God’s hand of ushering in the long succession of miracles which attest the faith of Januarius. The relics of St. Januarius rest in the cathedral of Naples, and it is there that the liquefaction of his blood occurs. The blood is congealed in two glass vials, but when it is brought near the martyr’s head it melts and flows like the blood of a living man. Reflection.—Thank God Who has given you superabundant motives for your faith; and pray for the spirit of the first Christians, the spirit which exults and rejoices in belief.